Singapore Cardfight! Vanguard Online: Cardfight! Vanguard Tag Team Battle Rules! Cardfight! Vanguard Tag Team Battle Rules! In the Anime Episode 87, rules for Tag Team are introduced! Here are the rules, they may or may not be the official rules if and when Bushiroad decides to hold official Tag Tournaments. The Damage zone will be in the centre of the Team with the Deck and drop zone on the outer edges. You may not converse or show the cards in your hand with your team mate. In order to achieve victory, you will need to deal a total of 9 damages to your opponent's team. 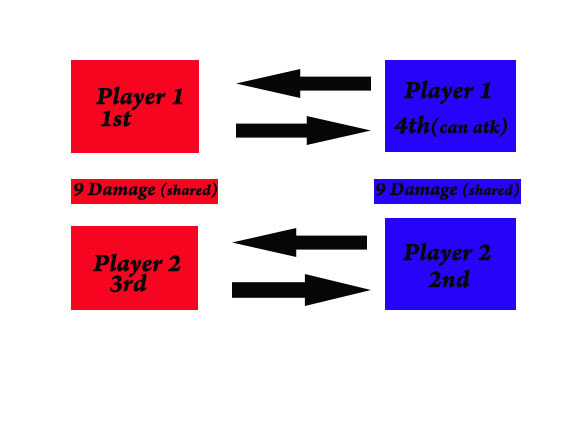 Damage is shared among the team members,you will lose when you and your teammate's total damage reaches 9 damage. You may only attack the player directly in front of you. You may use your teammate's damages to counter blast. Total team damage is used to determine if your units are able to activate Limit breaks. You may use your teammate's soul for soul blast as well. You can guard for your teammate with cards in your hand, however you may not intercept with your rearguards or use perfect guards for your teammate. Any ability that affects "your opponent" will only affect the opponent directly in front of you. eg "Silent Tom" can still be guarded with grade 0 units from your opponent's teammate when attacking. Any ability that affects "both players" will affect all four players. eg "Dark Cat" will allow all four players to draw a card. No attacks will be made in the first 3 turns of the battle, only the 4th player may start attacking. Player 1 of red team will start first, followed by player 2 from blue team, then player 2 from red team and lastly player 1 from blue team in which he/she can start attacking! These rules are the rules that are compiled from the anime, as such there may be some questions. If you notice any errors, feel free to inform me! Hope you'll continue to enjoy Cardfight! Vanguard! Patrick: Cannot guard for your teammate using perfect defense even though both person is using the same clan. In simple word, the perfect defense can only use it for yourself. Are the damage zones of teammates treated as the same damage zone? I can see a lot of potential Angel Feather plays. Can hold it in north,south,east,west and center of Singapore ? would you be able to use team mates units for costs such as raptor colonel using my team mates units? Can you retire a player's rearguard when they are across (diagonal) from you? i.e. If I use Ambush Eradicator Linchu's skill to retire, can I retire a grade 1 or lower rearguard from EITHER of my opponents or just the one in front of me? would daunting deletor, oksizz's skill with 'all of your opponent's vanguards' affect both of your opponent's vanguards?